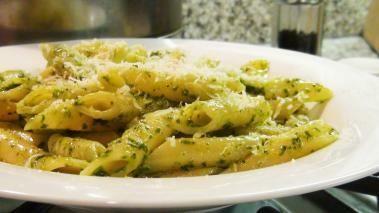 I’m not sure why Penne Pesto has become such a classic combination, but I do know that it’s a damn fine pasta recipe. I’ll end up making pesto every few months (generally in large batches and freezing some), as it’s really easy to make, tastes great, and can be used in a ton of different ways. For this recipe, I’ll show you how to toss the fresh pesto sauce with some penne pasta, a bit of olive oil, and parmesan cheese to make a vibrant looking and tasty quick and easy meal. Now, if you must, you can certainly buy pesto, and there are some decent options out there. Simply follow the same steps below, and you’ll be good to go…but I hope you give homemade pesto a try! Hope you enjoy this Penne Pesto recipe as much as I do! Taste the penne pesto right before serving and make any final adjustments. You may need to add salt/pepper. Reserve a bit of pasta water, in case you need to thin it out. And you’ll likely want to drizzle a bit of fresh olive oil and parmesan cheese over the top right before serving. You don’t need to get perfectly smooth, but it should be nicely pureed. Taste the pesto. Once drained, add olive oil to coat the sauté pan, and add the penne. Wine Recommendation: I love the fresh, bright and herby taste of this penne pesto, and look for white wine that are austere and minerally to pair with it. Of course, I also really love to serve regional wines with regional foods, so you can find an Italian white you love that would be great. Try out Vermentino or even a simple Pinto Grigio. Hope you enjoy the pairing with this Penne Pesto.